I believe I just came across an error in the manual. I wonder if anyone else has noticed this yet. 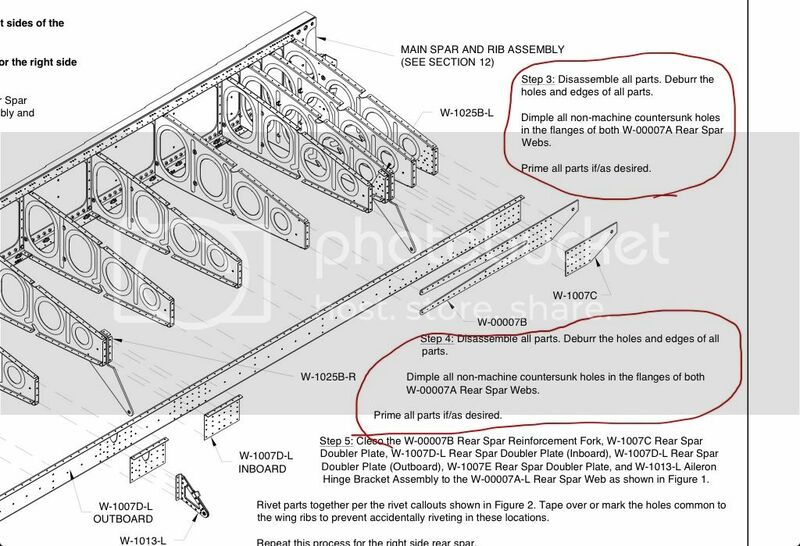 On page 12-06, Figure 2 it shows connecting the torque tube support bracket to rib W-1010-R. It also shows a flap hinge bracket attaching to that same rib. The rib does have a drill pattern that matches the flap hinge bracket, but on all other drawings there doesn't seem to be any flap hinge brackets attached to that rib. I'm guessing that's an error in the drawing and this rib should not have the flap hinge bracket. 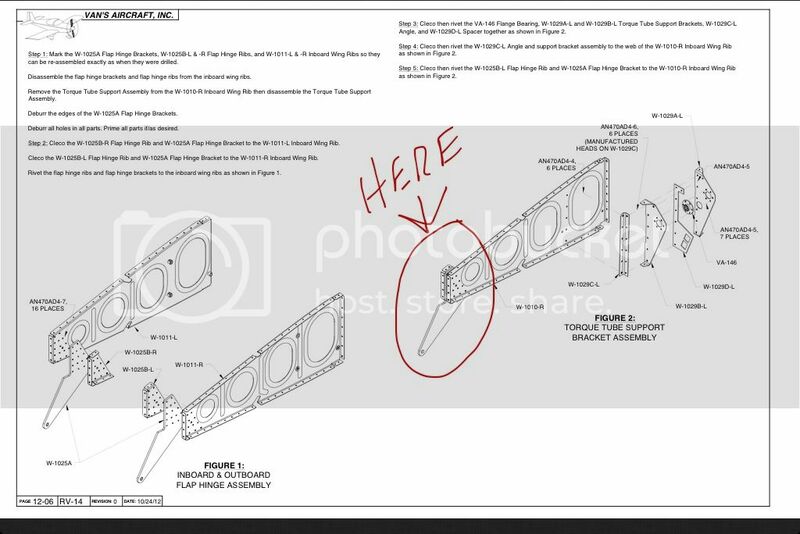 Also the wing kit only came with two flap hinge brackets per wing which show attached to ribs W-1011-L & R.
I've sent an email to Van's to confirm if this in fact an error in the manual and will post what I find out. By the way, the wing kit isn't quite as easy as expected. The wing ribs are the same ones that are used in the RV-10, so they are not drilled to full size. At least the skin holes are drilled full size so still no match drilling required. The manual just indicates to drill all the wing ribs prior to assembly. I see on the RV-10 that the flap hinge , W-1025A , is on rib W-1010 and that is probably where Van's went wrong. This one? Good eye Mark! Yep, that's it. Although it is odd that the W-1025 ribs need to have all the flap bracket holes drilled and the W-1010 rib has all those holes but they don't get used. Oh well, less weight. N214VA, the RV-14 prototype, has three flap hinges (like the RV-10) instead of the two used in the final wing design. Instead of the inboard hinge bracket being located on the root rib like the RV-10, I believe it goes on the next rib outboard. You can use the main wing skins as a guide to confirm the proper location of both the brackets. ...... and you are going to have a lot of fun getting the aileron torque tube bracket in place on the root rib if they are RV-10 parts! Another small one that easy to pick out. 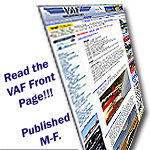 Page 14-03, rivet call out, figure 2 has 426AD3-3.5 on the wing box J stiffners every where but in the wing walk area. There they call out for 426AD3-4s but the wing walk doublers do not pass under the j stiffners and the rivets should be 426AD3-3.5 all the way along the j stiffner from the inboard side of the W-00002 wing skin to the lap seam but not including the lap rivets. Just a small typo on page 13-04. I also noticed on that same page that it shows to machine countersink the third from the top row of holes on W-1007C. But then it shows using AN426AD4-8 rivets on the 4th row. So obviously that row needs to be countersunk. The question is what to do with the third row?